Superheroes tend to have code names. The closest Ralph Hinkley ever got was "Super Guy" or "Captain Gonzo". 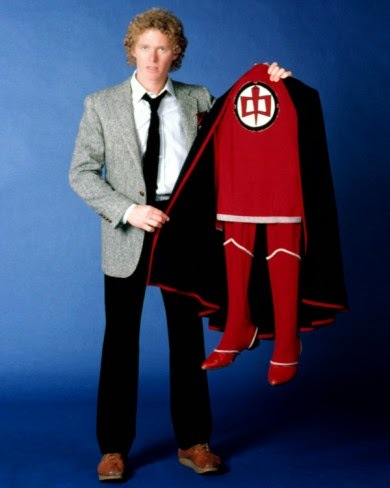 As you probably know or can recall hearing an old man jabbering about, Ralph was 'The Greatest American Hero' from 1981-1983. When I was six he was the best. Ralph tried really hard and he crashed into things... a lot! In my early 20s, GAH became synonymous with making rash purchases based on nostalgia. One of my first complete season DVD acquisitions... turned into bitter disappointment. My arrogant opinion back then: the show was bland, only sporadically funny, hellishly repetitive, and inconsequential. Trying again is what a superhero is all about, so when all it was costing me was time and my sanity... I watched all 44 hour-long episodes on YouTube. And (much like using a powerful alien spacesuit when you've lost the instructions), I CANNOT recommend it. GAH is a phenomenal concept, executed by well-meaning people, and it was NEVER intended to be shotgunned in this way. I got SO bored during season 2 that I tried screening 4 episodes at once on all 4 devices at my disposal- TV, laptop, iPad, and iPhone. Does this count? Was I even following the story at that point? Don't Care! I finally watched it, and I'm never doing it again. Until next time. With the assistance of mysterious alien voices on the radio, snarling FBI agent Bill, and long, long, LONG suffering girlfriend Pam, Ralph overcomes adversity, often caused by his own inability with his abilities. He breaks his own home, and doors, and friends. His ESP has him wearing women's clothes and reacting to things that aren't there. His invisibility is unreliable and his shrinking is pretty damn unconvincing. He flies as low as he dares and as rarely as he can. He ends up looking silly all the time, and would rather not be caught dead in his own magic jammies. But he can always shrug it off. Ralph's a teacher, and from Ralph I learned something valuable: I will fail. I will look ridiculous. And I will not stop trying even when the payoff is mediocre. Here's to ordinary people who help others- especially if the only cost is your dignity.